This recipe was requested by Courtney in the Protein Pow Recipe Request Vault – a space where people go to submit their recipe requests, without a single thought of ‘maybe this isn’t possible because it’s never been done before…’ The way it works is this: you submit a recipe into the Protein Pow Request Vault and, every month or two, I reach in there and randomly select someone’s recipes to try my best to bring to life here at proteinpow.com. There really are no boundaries to the kind of recipes you can submit. In fact, I urge you to be as wild as possible and ask for any recipe your heart desires because anything goes in the land of Protein Pow, no matter how unusual. Anything goes. For example, you want Coffee & Whey Protein Bars? Done. You want Gluten-Free Protein Crackers? You got it. How about some… Protein Macarons? Now, if you’re a lover of macarons – of proper sugar-packed macarons – you may be thinking that these protein ones can’t be as good. You might even be angry at me right now, thinking me a fool for attempting to recreate something as classic as a macaron without using any of the traditional ingredients. Well, guess what? I did it! And dare I say they’e better than the originals? I’m not saying this because I made them. I’m saying it because I’ve tasted the ‘real’ ones and I’ve tasted these ones and I like these ones better. Sure, they’re a little rough around the edges and don’t look as immaculate as traditional macarons but that’s because this is my first proper attempt. Give me a couple more shots and I’ll show you just how crazy protein macarons can really look. They have the perfect texture: crunchy on the outside and slightly chewy on the inside, and they taste mmmmm… so good! I went with two basic kind of macarons: blue ones and red ones. You can make them any color though, just read the notes at the bottom of this post to experiment with your hues – and your flavors too. 1. First, make your macarons (one color at a time) by adding all the ingredients together and mixing them all up with a spoon until you get a soft dough that you can mold with your hands into one big ball (it’s going to feel like play-dough!) If your dough is too sticky to allow you to do this, add a bit more coconut flour to it until you get to the right consistency. 2. Shape 10 small ‘balls’ out of the mix and, using your hands, flatten them and place them on a nonstick baking tray or a regular cookie tray lined with baking paper. 3. Bake at 200C (around 395 F) for FOUR AND A HALF TO FIVE MINUTES. Do NOT let them cook for longer as they’ll burn. 4. Make your filling by mixing all your filling ingredients together. See Note 4 below for more on this. 5. Fill the macarons with your filling of choice and eat them as soon as you can because they’ll loose some of their crunch if you leave them sitting outside (this is one of the only downside to protein macarons – am trying to figure out a way to fix this without invoking sugar). Macros per macaron half, out of the 10 you get for each color (without the filling because, as you’ll see in Note 3 below, the filling is up to you): 15kcals, 2g protein, 3g carbs (out of which 2.5g is fiber so net carbs: 0.5) and 0g fat. 1. I used IMO syrup to make this recipe, i.e. isomalto-oligosaccharides syrup. I wrote about this ingredient last week when I posted my recipe for Low-Carb Protein Oreos and included a couple of links to places you can get IMO as well as an idea for making your own IMO if for whatever reason you don’t have access to it as a syrup. There’s also a discount code to get IMO in the UK in the ‘NEWS’ section of the Protein Pow App. 2. To color my macarons, I used natural blue food coloring for the blue ones (which I know turned out greenish) and fresh beet juice for the pink ones. You can use any and all colors though as well as flavoring extracts and essences. Remember to choose natural flavors when possible, e.g. use beet juice for red and pink, saffron strands for yellow, blackberries for blue. Or get something like this). 3. I didn’t actually measure my filling ingredients. I know, sorry. I just kind of winged the whole thing by mixing 1 scoop of whey with approximately the same amount of coconut flour and a bit of milk. I suggest you do the same OR, if you want, use casein protein powder and mix that with the milk until you get a creamy mix. You can do that OR you can mix your whey with cream cheese or mascarpone for an ever creamier filling. 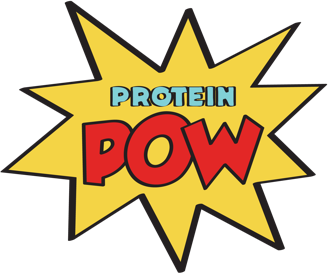 PS: Don’t forget to download the Protein Pow App! New recipes are being added to it right now and should go live by the end of this coming week.